Pilgrim Craft and My Week in Review! I was busy in my classroom this week. Not only did we make pilgrims and turkeys and do a ton of shape learning with Investigations, I also fit in playing hookie and going to Christmas Village Craft Fair on Friday! Your pilgrims are SO adorable! Would love to win! Too cute! Love the little pilgrims they are super cute! We are learning all about pilgrims and the mayflower next week and these would be perfect. Oh my goodness!!! Those pilgrims are ADORABLE and congratulations on being on the front page!!! You Rock! Your Pilgrims are so cute!! Looks adorable! I would love to win! I can use more great resources, it is my first year in first grade! I love your pilgrims. I would love to win. I love your pilgrims too!! Would love to win 🙂 Thanks for chance! Okay the pocket chart photo is hilarious!!!! I laughed Out. Loud. If you want to head on over to my blog I'm having my 500 Follower giveaway with lots of TpT prizes and an Amazon gift card! Haha, I love that the S got covered up on the pocket chart pic! What a neat pilgrim craft! I also love how the s is covered on the pocket chart sentence. I love your pilgrim craft too. I would love to add it to our study this mointh. What adorable Pilgrims. My kids would love to win so they could make these cuties! I love the turkeys. 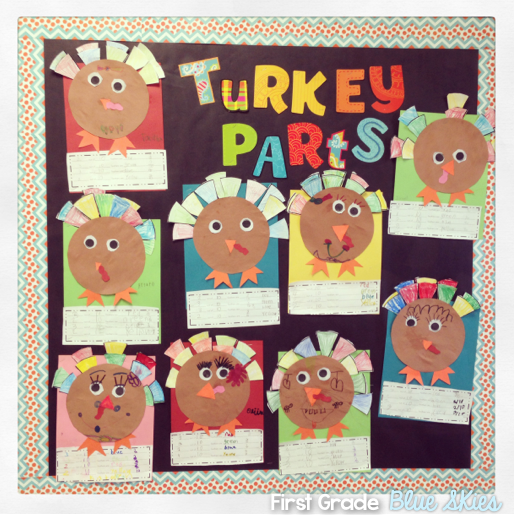 Our third grade kiddos just went to school forest and learned all about turkeys. What a cute way to write what they learned. I can't wait to pass on the idea! Thanks for sharing! I love your cute Pilgrims! Super cute pilgrims. The pocket chart was hilarious. 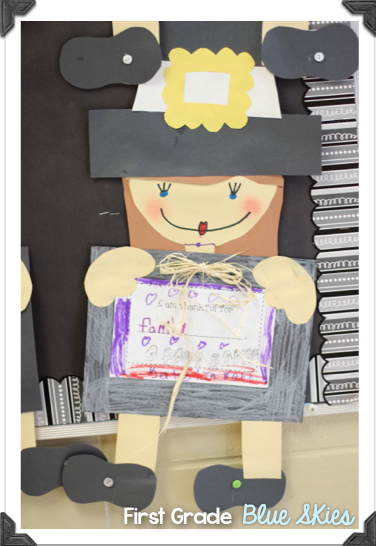 The pilgrims are precious, and I would love to do them with my class! I have a question with my comment. I have noticed in some of your character crafts, as well as in the pilgrims, have "blushy cheeks". What do you use to make that or do the kids do that? Too cute! I use red artist chalk and I (or the students) wipe a bit on a paper towel and then rub it onto the cheek area =) Hope that makes sense! Those pilgrims are so cute! I'd love to win the precious pack! Those pilgrims are so cute! My kids would love to make them. Those pilgrims are adorable! And I was dying when I saw that sentence!!! Too funny! The Pilgrims are so cute! I would LOVE to use them in my classroom this year! Thank you for the opportunity and thank you for all of your pictures and wonderful ideas in your blog. 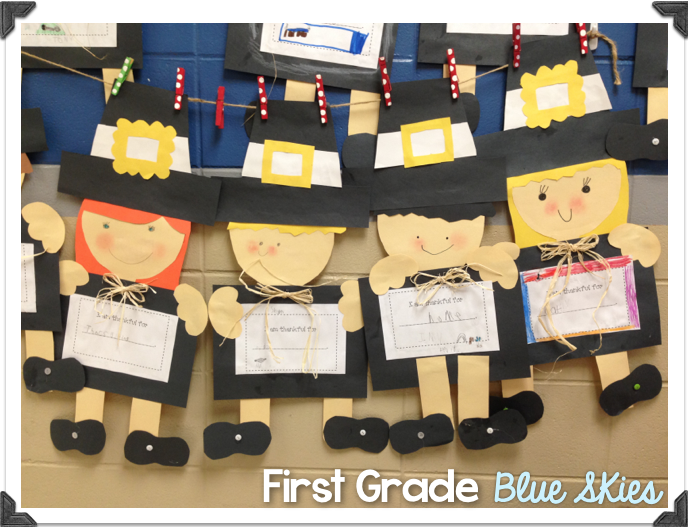 I love all of your stuff, but those pilgrims are ADORABLE!! Would love to win this pack! Thanks! 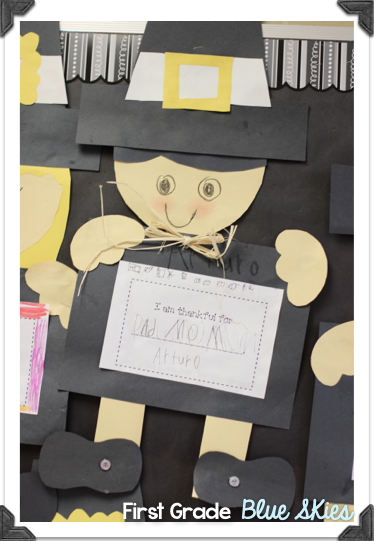 Oh my gosh — those pilgrims are too sweet! Love!! What a cute activity! Love it! This activity is great! What a great writing activity also! I would love to win this and use it in the classroom! Thanks for the wonderful ideas! You are just da' bomb… I am bringing that phrase back!!! Your pocket chart cracks me up! My 'nearly died' moment came when a boy was writing about the poem 'Smart' and said he had five pennies. But he conveniently left out one N and an E. Uh huh…and I had it hanging in the hall! If I am not too late, I would love a chance to win your pilgrim packet! I love your crafts too! A friend sent me this link to your blog spot! I will definitely come back and visit again! Thanks for the ideas! I bought this pack a while ago Jen but just wanted to pop in and say hi,,,everything looks great as always my talented friend. 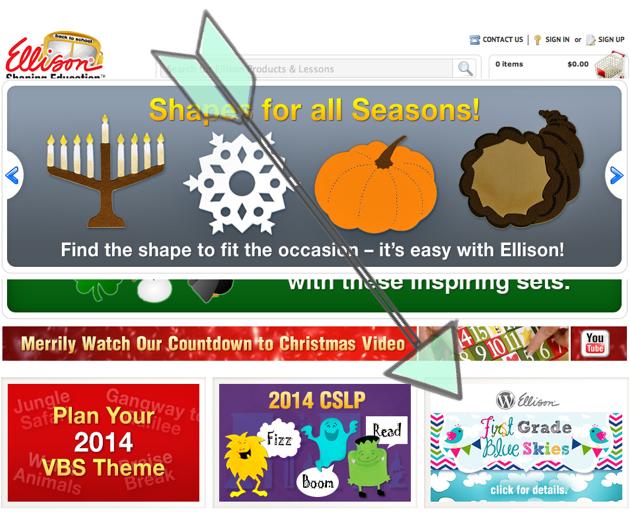 Just saw this pack on TPT and would LOVE to have it…they are so cute and my kiddos would love to make them! 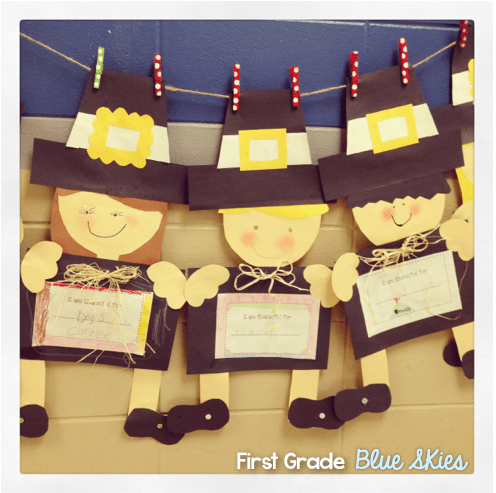 You always have the cutest crafts…this pilgrims are simply adorable!! The pilgrims are super cute! I am cracking up at your pocket chart! My husband is looking at me like I'm crazy. 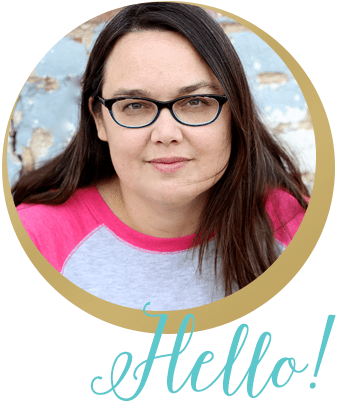 This is my first time visiting your blog and I must say I love it!